In a letter to staff on Monday, Alles has lashed out at media for similarly bending the facts about his just-announced departure from the Trump administration. “No doubt you have seen media reports regarding my ‘firing’. I assure you that this is not the case,” Alles wrote, adding that he had been “told weeks ago” of an impending “transitions in leadership” at the Department of Homeland Security. The letter, cited by CNN, does not name any other reasons for Alles to leave his post, apart from the Trump-ordered shake-up. “The President has directed an orderly transition in leadership for this agency and I intend to abide by that direction,” Alles wrote, lamenting that he did not get to address the staff before the news was broken by White House Press Secretary Sarah Sanders earlier on Monday. James Murray will take over as director starting in May, she said. Speaking at a press briefing, Sanders said that Alles would be “leaving shortly” and praised him for “doing a great job at the agency” during the two years he was at its helm. While Sanders did not specify on what terms Alles was to leave, many US media have rushed to report that he was shown the door by Trump. Alles is the second high-ranking DHS official to leave his post in just two days, following DHS Secretary Kirstjen Nielsen, who resigned on Sunday and was replaced by Kevin McAleenan, the current US Customs and Border Protection (CBP) commissioner. Last week, Trump made an about-face and withdrew the nomination of acting Immigration and Customs Enforcement (ICE) chief Ron Vitiello for a permanent spot as the agency’s head. What is seen as a major overhaul of the DHS is rumored to continue, with United States Citizenship and Immigration Services (USCIS) director Francis Cissna and DHS General Counsel John Mitnick named as the next potential victims. 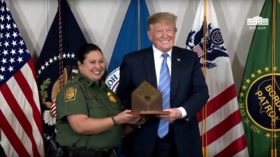 While no explanation has been given as to the causes and timing of the DHS makeover, it has been speculated that Trump is dissatisfied with what he saw as DHS’s lackluster approach in enforcing his hardline immigration policies. Trump has repeatedly threatened to shut down the southern border unless the flow of migrants and drugs into the US is stopped.